In the international bestseller, Thinking, Fast and Slow, Daniel Kahneman, the renowned psychologist and winner of the Nobel Prize in Economics, takes us on a groundbreaking tour of the mind and explains the two systems that drive the way we think. System 1 is fast, intuitive, and emotional; System 2 is slower, more deliberative, and more logical. The impact of overconfidence on corporate strategies, the difficulties of predicting what will make us happy in the future, the profound effect of cognitive biases on everything from playing the stock market to planning our next vacationeach of these can be understood only by knowing how the two systems shape our judgments and decisions. Engaging the reader in a lively conversation about how we think, Kahneman reveals where we can and cannot trust our intuitions and how we can tap into the benefits of slow thinking. He offers practical and enlightening insights into how choices are made in both our business and our personal livesand how we can use different techniques to guard against the mental glitches that often get us into trouble. Winner of the National Academy of Sciences Best Book Award and the Los Angeles Times Book Prize and selected by The New York Times Book Review as one of the ten best books of 2011, Thinking, Fast and Slow is destined to be a classic. Start reading Thinking, Fast and Slow on your Kindle in under a minute. "Daniel Kahneman is one of the most original and interesting thinkers of our time. There may be no other person on the planet who better understands how and why we make the choices we make. In this absolutely amazing book, he shares a lifetime's worth of wisdom presented in a manner that is simple and engaging, but nonetheless stunningly profound. This book is a must read for anyone with a curious mind." --Steven D. Levitt, William B. Ogden Distinguished Service Professor of Economics at the University of Chicago; co-author of Freakonomics and SuperFreakonomics. 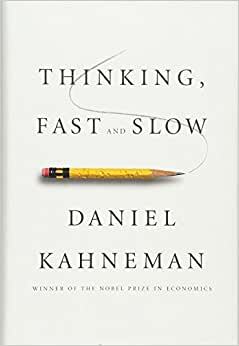 "Thinking, Fast and Slow is a masterpiece--a brilliant and engaging intellectual saga by one of the greatest psychologists and deepest thinkers of our time. Kahneman should be parking a Pulitzer next to his Nobel Prize." --Daniel Gilbert, Harvard University Professor of Psychology, author of Stumbling on Happiness, host of the award-winning PBS television series "This Emotional Life"
This book is incredible for discussing the rationality of human beings. Human behaviors are not only irrational, but also predictably irrational, which is the main topic of this book. This book has divided into 5 main topics, and discussed three different pairs of concepts. The first one is our thinking system, one is fast (denoted as system 1), another is slow (denoted as system 2). System 1 is just like our intuitive thinking, and system 2 is like deliberate thinking. Many of our irrational behaviors are caused by the fast response of system 1, together with the laziness of system 2. The second pair is Humans and Econs, which Econ means the rational assumption assumed by classic economists, and Human means the actual human in the daily life. The Prospect Theory is used explained in what kinds of situation that humans do not behave like economists have predicted, and why. The third pair is the experiencing self and remembering self. The feeling we experience during the events is very different than the the feelings in our memory, which sometimes cause decision making not as make sense and let us regret later. Recommended to anyone interested in psychology, statistics and human improvement. Information is well provided including reference quotes at the end of each topic/section to improve understanding. Great concepts and examples of how our biases or recent experiences affect our current outlook. Great for anyone wanted to be a more "rational" decision making individual. I found at least one lesson in every page.A great help to those who care to understand why we behave as we do. This is a must read for anyone anywhere who makes a decision about anything. Absolutely mind shaking, I am still recovering. It is an absolute treasure. So many valuable academic work combined in a single book. 100% recommended. A great book on behavioural science. Gives realistic insights into every day biases and mental fallacies. Really enjoyed reading it as could relate to most of stories.